Saving for retirement is not an area of financial strength for Americans. Too often, meeting the financial demands of today means delaying, diminishing or simply never starting to save for tomorrow. GoBankingRates asked Americans how much money they have saved for retirement and found that most people are behind on their retirement savings. These survey findings also provide a helpful benchmark against which readers can compare their own retirement savings balances and progress. I don’t have retirement savings. GoBankingRates analyzed the survey results to reveal key insights into how Americans of all ages are saving for retirement. Whether due to various economic factors or not correctly prioritizing finances, many people are not on track to have enough money to cover their expenses during retirement. One-third of Americans report they have no retirement savings. 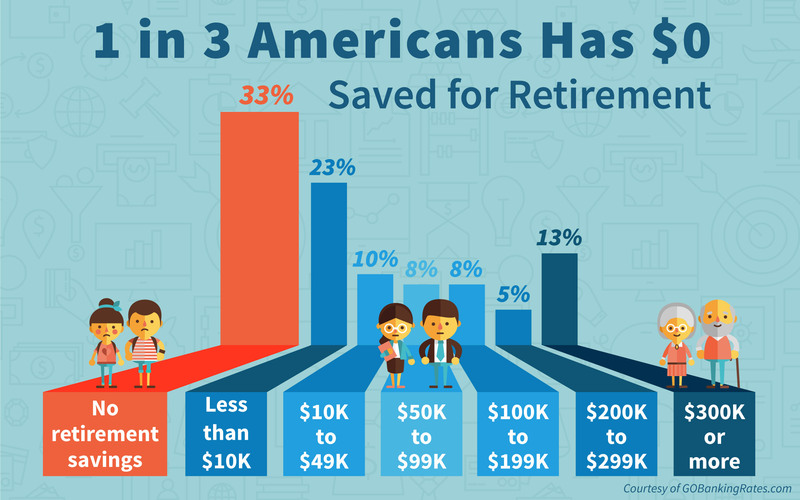 23% have less than $10,000 saved. This lack of savings indicates that just getting started on retirement planning is a significant obstacle for many people. This difficulty can be due to a lack of education on the importance of retirement savings, said Kristen Bonner, the GoBankingRates research lead for this survey. “Americans might also be feeling as though their employer match ― or lack of ― is not enough to make it worth it to open an account, as well the growing trend of changing jobs every couple years and not wanting to deal with rolling over funds from one account to another,” Bonner said. A significant 13% of Americans’ retirement savings balances are in the top bracket. “The fact that so many Americans do have $300,000 or more saved for retirement goes to show just how easily the amount of money in your retirement fund can grow over time if you are dedicated to contributing regularly,” Bonner said. 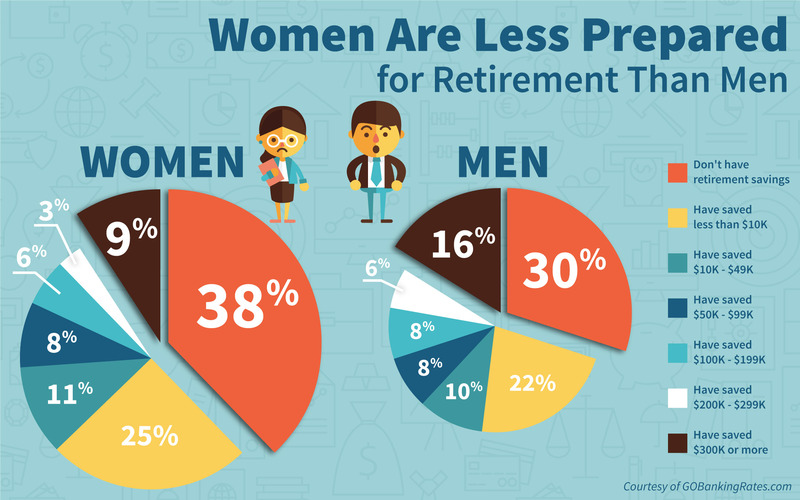 Women are 27% more likely than men to say they have no retirement savings. Two-thirds of women (63%) say they have no savings or less than $10,000 in retirement savings, compared with just over half (52%) of men. The gap between men’s and women’s retirement savings widens as balances get higher: Whereas men and women are about as likely to have $10,000 to $99,000 saved for retirement, men are twice as likely as women to have savings balances of $200,000 or more. One reason women fall behind is the gender pay gap. “Women cannot save as much for retirement because they are not earning as much,” Bonner said, citing 2015 U.S. Census Bureau data that shows women earned $0.79 for every dollar men earned in full-time positions. Families trying to prepare for retirement need to factor such deficits into their financial plans. “Women also are more likely to have gaps in employment to raise children and might not be contributing to retirement accounts during those periods when they’re not working,” Huddleston said. Women’s retirement savings needs are also greater than men’s. “Women not only need to catch up with men but they also need to save more because their medical costs tend to be higher in retirement,” Huddleston said. Women are also more likely to live longer, increasing their chances of outliving retirement funds. To make up for anemic earnings and plan for their higher retirement costs, women need to be proactive and save aggressively. “Financial experts typically recommend saving 10% to 15% of your annual pay, so women should aim for that higher percentage to close the retirement savings gap,” Huddleston said. Retirement savings are closely tied to savers’ stages of life. For young people just starting their careers, simply saving at all could be a sufficient goal, while those nearing retirement will likely want to have at least a few hundred thousands of dollars in their retirement accounts. 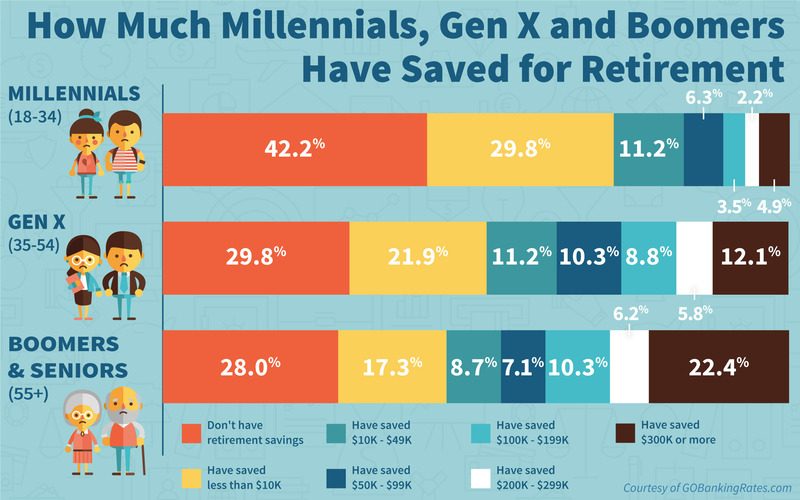 GoBankingRates conducted this survey in three different parts aimed at specific generational age ranges ― millennials ages 18 to 34, Gen Xers ages 35 to 54, and baby boomers and seniors ages 55 and over ― to get an accurate picture of how Americans’ savings differ by life stage. Millennials are 40% more likely to not have retirement savings than Gen Xers and 50% more likely than people age 55 and over. About half of Gen X is making a significant effort to save for retirement ― 48.2 percent have saved over $10,000, including 26.7 percent who have saved $100,000 or more. Boomers and seniors are 85% more likely than Gen Xers to have $300,000 or more in retirement accounts and 4.6 times more likely than millennials to have saved this amount. As the youngest group surveyed, millennials are the least likely to have substantial retirement savings. Three in four (72%) of millennials have saved less than $10,000 or nothing at all. 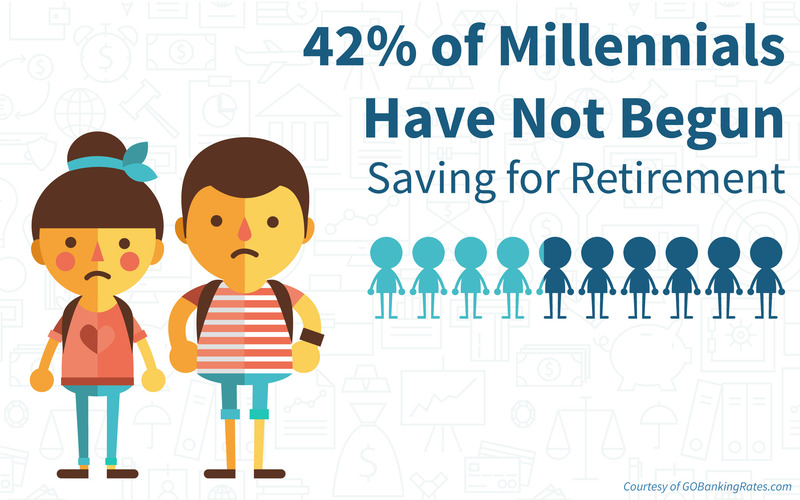 42% of millennials indicated they have no retirement savings. The number of millennials with no retirement savings yet is 52% for younger millennials ages 18 to 24 but a more reasonable 36% for older millennials ages 25 to 34. The most common balances that younger millennials have saved are “less than $10K,” at 30%, and “$10K to $49K,” at 11%. Older millennials are twice as likely as younger millennials to have saved $10,000 to $49,000, at 14% versus 7%, respectively. Overall, fewer millennials are saving for retirement than should be, but many millennials’ retirement savings are actually on track, especially among the those ages 25 to 34. For this group, saving now and saving regularly will make all the difference. Saving as little as 5% of your income can make a big difference long term, Bonner added. “Make sure to always take advantage of any employer matches, and automatically transfer funds from your paycheck to your retirement fund so that you do not even think of that money as disposable income,” she said. Although some Gen Xers are hitting their retirement savings goals, just over half (52%) still have less than $10,000 in retirement savings. A big contributor to this low amount could be the Great Recession, which hit Gen X the hardest, costing members of this generation 45% of their net wealth on average, according to The Fiscal Times. This loss was a major setback for a generation that is saddled with a wide range of financial obligations, from mortgages to aging parents and children entering adulthood. Both younger Gen Xers (ages 35 to 44) and older Gen Xers (45 to 54) are equally as likely to not have a retirement account, at 31%. Among younger Gen Xers who have a retirement account, most have lower balances of less than $50,000. 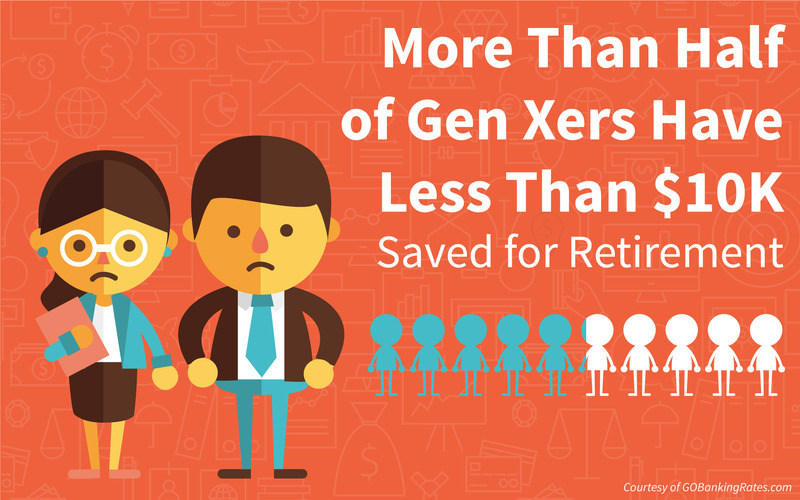 An impressive 40% of older Gen Xers have managed to save $50,000 or more in retirement accounts. Over half of those older Gen Xers in that 40% have balances of $200,000 to $299,000 (7%) or $300,000 or more (15%). About 3 in 10 of respondents age 55 and over have no retirement savings. 26% report retirement savings with balances of under $50,000, an amount that is insufficient for people nearing retirement age. Over half (54%) of people age 55 and over have balances far behind typical retirement fund benchmarks for their age group. More likely, however, those without retirement savings couldn’t or didn’t make saving for retirement a financial priority. “Without savings of their own, they’ll have to rely solely on Social Security,” Huddleston said. 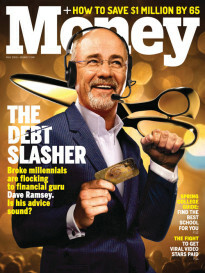 Baby boomers most often cited Social Security as their expected primary source of retirement income (35%), according to a 2015 report from the Transamerica Center for Retirement Studies, whereas Gen X and millennials expected retirement accounts like 401ks or IRAs to be their main source of retirement income. 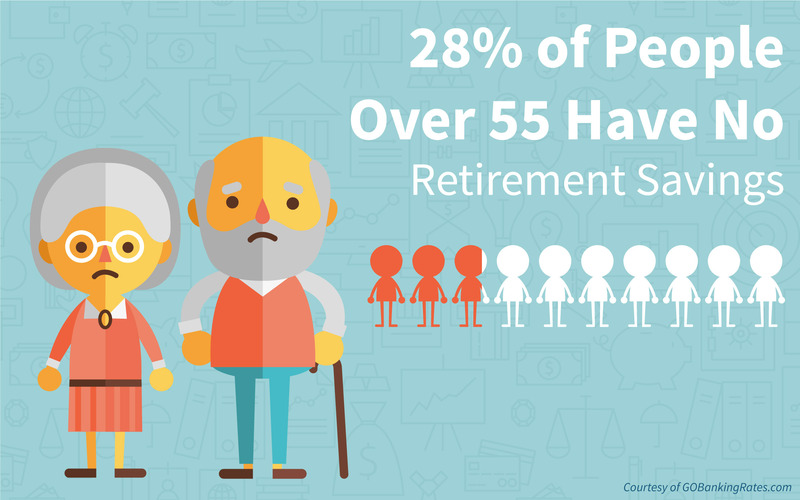 26% of baby boomers nearing retirement (ages 55 to 64) report healthy retirement savings with balances of $200,000 or more. 31 percent of seniors at or above the retirement age (65 and over) have balances of $200,000 or more. “Those who have saved more than $300,000 have clearly made saving for retirement a priority and want a more comfortable lifestyle in retirement than what Social Security benefits will afford them,” Huddleston said. A little less than half of people ages 18 to 24 are on track simply by having started a retirement fund. Among the people just a few years ahead of them, around age 30, significantly more ― two-thirds ― are already behind on saving for retirement. Younger people are in the best position to recover if they’ve fallen behind because they have more time to use compound interest to their advantage. “Those who are in their 20s and 30s with $10,000 or less in retirement savings still have time to catch up if they make saving a priority,” Huddleston said. For those age 40 and over, however, the picture is bleaker: Among those in their 40s and 50s, four in five savers have balances that fall behind the benchmarks for their age groups, which means only about 20 percent are on track for retirement. 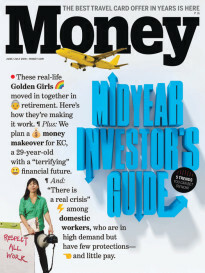 Among those 60 and over, about a quarter have sufficient retirement savings, but the other 74 percent are still behind. With less time to save as each year passes, these older age groups need to reevaluate their financial priorities. The large majority of Americans age 40 and over who are behind on retirement savings can potentially catch up or compensate for their anemic retirement accounts by making changes to their savings plans now. The first step is to start saving regularly. Consistent savings, even in just small amounts, is the best way to ensure a retirement fund is growing. “Day to day, it might not seem as if the balance in your 401k or IRA is increasing significantly, but 10, 20, 30 years from now, your future self will be thanking you,” Bonner said. If money is put into high-yield accounts or invested wisely, compound interest on small savings can help produce a sizable nest egg. “If you wait until you’re 40 or so to start saving, you’d have to save three or four times as much ― or more ― each month to accumulate the same amount as those who start saving earlier,” Huddleston said. Upping retirement savings contributions is also necessary to catch up. People age 50 and over can make catch-up contributions of $6,000 to a traditional 401k, for example, in addition to the regular $18,000 annual 401k contribution limit, according to the IRS. Lastly, those nearing retirement might need to adjust their expectations, Huddleston said. “Older Americans with little saved will have to work a lot harder to set aside more and likely will have to work longer ― or never fully retire,” she said. People who view retirement as something that is just around the corner can help themselves stay on top of their retirement contributions so that they don’t fall behind. By keeping retirement at the top of the financial priority list, it can become less of a far-off dream and more of a soon-to-be reality. Methodology: GoBankingRates’ survey posed the question, “By your best estimate, how much money do you have saved for retirement?” Respondents could select one of the following answer options: 1) “Less than $10K,” 2) “$10K to $49K,” 3) “$50K to $99K,” 4) “$100K to $199K,” 5) “$200K to $299K,” 6) “$300K or more,” or 7) “I don’t have retirement savings.” Responses were collected through three separate Google Consumer Surveys conducted simultaneously Jan. 21-23, 2015, and responses are representative of the U.S. online population. Each survey targeted one of three age groups: 1) ages 18 to 34, which collected 1,502 responses with a 2.3 percent margin of error; 2) ages 35 to 54, which collected 1,500 responses with a 1.2 percent margin of error; and 3) age 55 and over, which collected 1,504 responses with a 4.3 percent margin of error. The overall and gender-based analysis looked at the combined responses provided in all three surveys; for the gender analysis, only responses for which gender demographic information was provided were included.